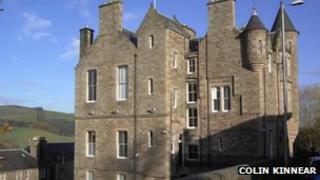 A Dutch motorist under the influence of drugs tried to talk his way into a house in the Borders thinking it was a hotel, a court heard. When holidaymaker Willem Benedic, 59, was sent packing he drove over the lawn and collided with a garden wall. He admitted driving while unfit through drink or drugs in the Berwickshire village of Cove at the weekend. He was banned from driving for 15 months, fined £300 and ordered to forfeit his Honda Civic car. Selkirk Sheriff Court heard how a member of public phoned Lothian and Borders Police to tell them how a man had turned up at his home in Cove believing it to be a hotel. The householder then complained the visitor had got into a car, driven over the lawn and struck a wall. Benedic, from Kerkrade, was traced by police nearby on the road between Cove and Pease Bay at Cockburnspath on Saturday evening. He provided a negative breath test for alcohol but was cautioned and charged with a road traffic offence after a medical examination found him to be unfit to drive through drugs. Benedic, who said he was holidaying in the area, appeared from custody at Selkirk Sheriff Court, where he pleaded guilty to a charge of driving while unfit through drink or drugs. The court was told that he had a previous conviction in June 2012 for drink-driving.